Zur chirurgischen Therapie des Ösophaguskarzinoms empfiehlt die aktualisierte S3-Leitlinie die transthorakale subtotale Ösophagektomie mit 2‑Feld-Lymphadenektomie für Plattenepithel- und Adenokarzinome (AEG Typ I) des mittleren und distalen Drittels. Beim AEG Typ III sollte die transhiatal erweiterte totale Gastrektomie mit distaler Ösophagusresektion zur Anwendung kommen. Der AEG Typ II kann durch beide Verfahren behandelt werden, wenn jeweils eine R0-Resektion erreichbar ist. Eine limitierte Resektion des distalen Ösophagus und des proximalen Magens kommt nur bei cT1 N0 M0 evtl. cT2-Adenkarzinomen des ösophagogastralen Übergangs ohne Risikokonstellation in Betracht, d. h. Grading G1/G2, intestinaler Typ, keine Siegelringzellen, weil dabei die Rate von Lymphknotenmetastasen am distalen Magen bei unter 2 % liegt. Minimal-invasive Verfahren haben durch die Reduktion der Gesamt- und insbesondere der pulmonalen postoperativen Komplikationsrate Vorteile gegenüber der offenen Ösophagektomie. 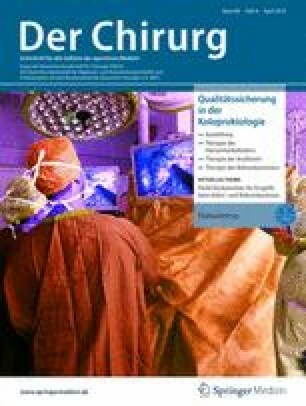 Dieses gilt für Hybrid (Laparoskopie und Thorakotomie) vs. offen bei der intrathorakalen Anastomose und total minimal-invasiv einschließlich der robotischen Technik vs. offen bei der zervikalen Ösophagogastrostomie. The updated German S3 guidelines recommend transthoracic subtotal esophagectomy with 2‑field lymphadenectomy for surgical treatment of esophageal cancer in patients with squamous cell carcinoma and adenocarcinoma of the esophagogastric (AEG type I) junction of the middle and lower third. For AEG type III transhiatal extended total gastrectomy with distal esophageal resection is favored. Patients with AEG type II can be treated by both procedures under the prerequisite that an R0 resection can be achieved. A limited resection of the distal esophagus and the proximal stomach can only be considered in cT1 N0 M0 possibly cT2 AEG junction without an oncological risk constellation, i.e. grade G1/G2, intestinal type and no poorly cohesive carcinoma, because the rate of lymph node metastasis at the distal stomach is less than 2%. Minimally invasive procedures provide advantages compared to open esophagectomy due to the lower rate of postoperative total and especially pulmonary complications. This is true for hybrid esophagectomy (laparoscopy and thoracotomy) versus open access in cases of intrathoracic anastomoses and for total minimally invasive esophagectomy including robotic techniques versus open access in cervical esophagogastrostomy. A.H. Hölscher, I. Gockel und R. Porschen geben an, dass kein Interessenkonflikt besteht.